I am more than sure that by now, you know that my little lady turned three at the end of June. 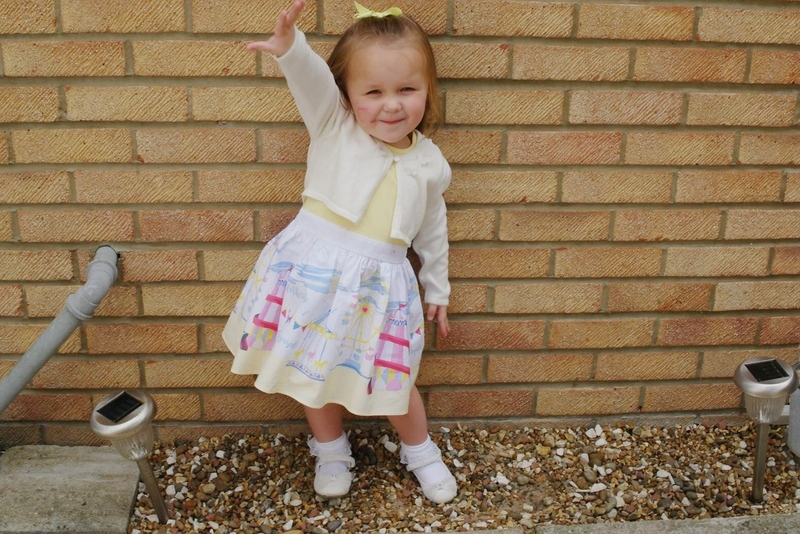 I am still refusing to believe that my baby girl is no longer a baby at all and in the blink of an eye, she is three. I now have a little girl! I’m not sure how it’s already been three years since she made her entrance into this world. Three years of morning snuggles. Three years of staying home with her. Three years of lots of books and kisses goodnight. Three years talking with my husband about how much of a light our daughter is in our lives. Three years have passed by so quickly and they’ve been the best three years of my life. 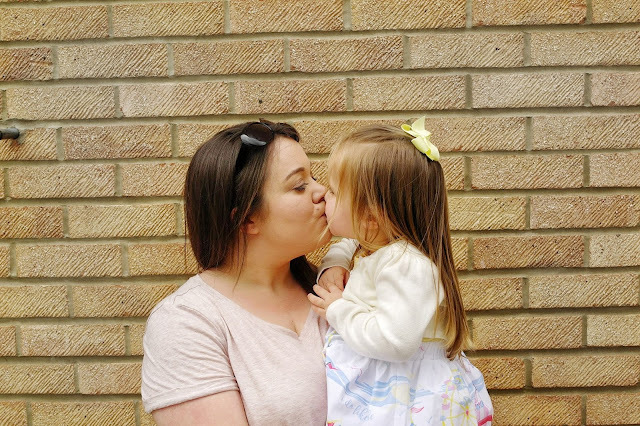 So feeling this way about her turning three, an after such an awful month in May we had to make her birthday special and celebrate with a Princess Birthday BBQ. June soon became known as 'my birthday month' or 'my party month'! So throughout the month, we were very busy preparing ourselves with the her impending Princess Birthday BBQ, which was supposed to be a small gathering, but 24 people kindly turned up to our home. It was a little cramped but we all enjoyed lots of food, lots of drink and oodles of fun. Even though I was quite tired after that BBQ I can't wait to do it again. The little princess woke up and we opened lots of presents and cards from all our family and friends. A big thank you to everyone who made an effort to send her something and get her gifts, we really do appreciate it. Thank you cards are coming your way!!! Seeing as our daughter was turning three, my husband and I decided to finally get our daughter her first bike. 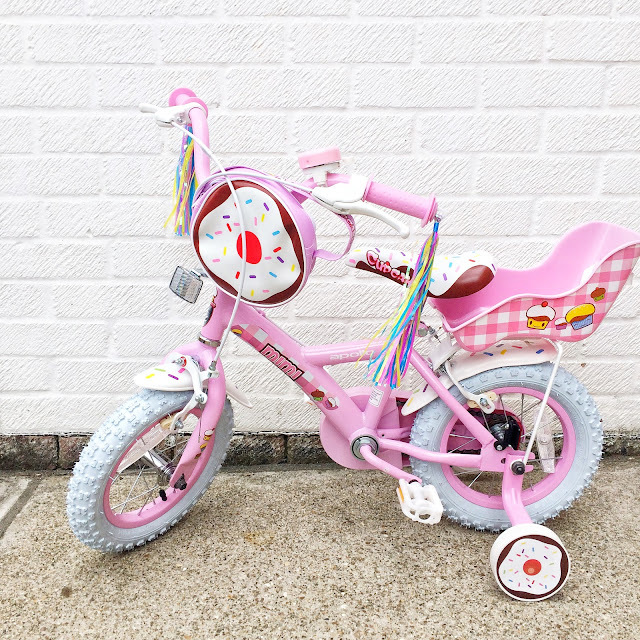 We took a trip to Halfords a few week prior to her birthday and she decided that she wanted this pretty pink cupcake bike, what little girl wouldn't want cupcakes all over her bike. We did try and get her a matching hat, but my child's head is too big!! !It must be because of her brain, haha! 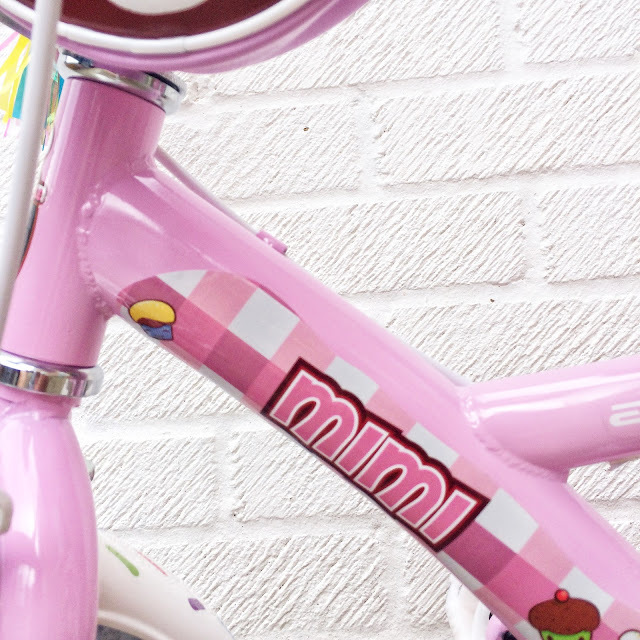 So instead we decided to get her first bike personalised with 'Mimi' and it was only like £10 and we got four replacements too. With opening the gifts out of the way, it was a quick shower for the little lady and then a few family photos near our 'photo wall' before our guests started to arrive. Is it just me but do you think all children look adorable in lemon? Just look at this little beauty! It was time to add our decorations to the garden and being the food preparation for our guests.. A floral table cloth and lots of bunting can do wonders to a garden. I was worried about my bunting flying away, as it was very windy, we used white tack to keep them still. Both my husband and I were busy preparing all the food for our guests with a quick outing for my husband to go and collect our daughter Rapunzel Princess Dress, as our daughter thought it would be a good idea to pluck and rip her current Rapunzel dress. But doesn't she look adorable. Nanny Caney dressed up as Cinderella. Don't they both look fantastic? My cousin also dressed as 'Princess Mummy Belle' and my daughter was in complete awe of Belle and wouldn't leave her alone for one minute. Most of our guests and their children arrived by 1pm, so it was time to light the BBQ and my husband only too happy to do this. Being a typical 'man' he wouldn't allow me to interfere with the cooking, so I had to finish preparing other meat, salads, pasta, and rice . It was quite the BBQ spread and it well down a treat, which is always a good thing when you are cooking for so many people. Wow, what a day! I'm not going to lie I was absolutely knackered after our daughter's birthday party. I think both my husband and I would need a whole week to get over our daughter's 'birthday weekend'. Our day ended with a few more family photos and ice poles. Until the next 'birthday month'!!! 5 comments on "Amelia Turns Three"
Awww 3 is a big one! They are so grown up at that stage - no more cot, no nappies... they are really over the baby stage. The princess birthday party was so lovely! !